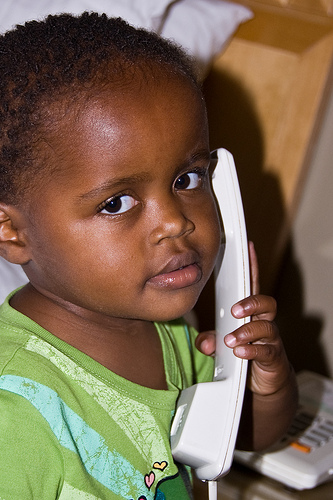 Crank Calling in Africa | "It's Not Wine, it's Mommy Juice!" So, it’s been five weeks. Five really long weeks and I so want to be home. But, I’m not and that kind of thinking doesn’t gel with the “roll with it” attitude that I’ve committed to. So, to put myself in a better mood, I’m going to relate this funny story that just happened about four minutes ago. There was a pause and then she said, “Ngiyaphila (I’m fine)” as though someone had asked her, “How are you?” Then she prattled on for a couple of minutes. It occurred to me that this would be a cute session to record on my iphone but I knew if I went into the bedroom she would stop her pretend conversation. So I picked up the phone in the kitchen to see if I could hear her and possibly record her that way. Imagine my surprise when I found that there was a person on the other end of the line, actually talking with her! I started laughing, Mgazi started laughing, the mystery person started laughing. Mgazi said “Bye bye!” and so did mystery person and they both hung up. I wonder who she called. More importantly, I wonder if the call was long distance. I’ve since unplugged the phone, but it hasn’t stopped her from periodically going in there, picking up the receiver, “Halloo?” Her phone sessions are shorter, though. I’m assuming that this is because she tires of keeping up both ends of the conversation. Oh gosh, oh gosh… you are NEVER going to believe it. During the time I typed the above, Mgazi has had perhaps four or five pretend phone conversations with the unplugged phone. And so I think, you know, I’m going to go take a photograph of her talking on the phone to put up with this blog. SO, I’m rummaging through my bag looking for my camera and I hear a tentative knock on the door. (This just happened, literally 30 seconds after I typed the last line to my blog entry.) I opened the door to find a staff worker who seemed to be embarrassed to be there. He says to me “they say, downstairs, to stop letting your child play with the phone.” Then he bows, and walks away. I’m abashed, because here I am about to encourage her to play with the phone so I can get a pic and apparently the phone connection was still intact! So, the conversations weren’t shorter because Mgazi got bored of talking to herself, it was that whoever was on the other end was sick and tired of talking to her!